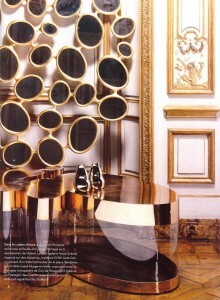 I’m loving this spread in the latest Architectural Digest (French edition). 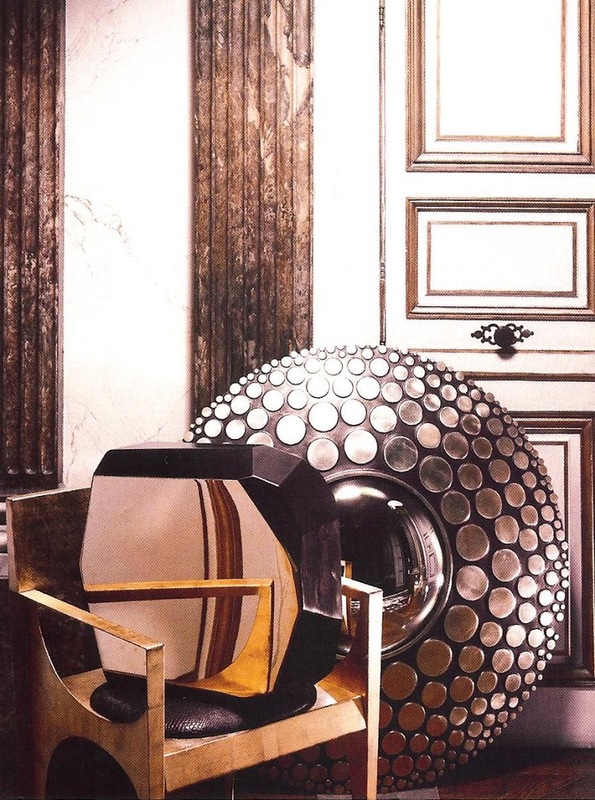 A stunning collection of objet d’or by some of the greatest contemporary designers of our day, I wouldn’t mind getting any of these from Santa this year! The even more stunnng backdrop is the Hôtel Arturo Lopez, just outside of Paris. Built in 1903 by Italian architect Paul Rodocanachi (a frequent collaborator of Jean-Michel Frank), the Hôtel was bought by the wealthy Chilean Arturo Lopez in 1930. Every room has a different theme including a miniature copy of the hall of mirrors from Versailles, and a room entirely covered with shells. At the moment, from what I can make out, this incredible home (which was purchased by the local municipality in 1971) is now being used as a museum. I hope you enjoy this collection as much as I did! This is probably my favorite pic…how stunning is that marble! 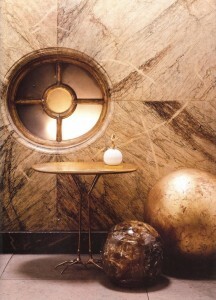 The bronze table is by Meret Oppenheim, and the two gold spheres – one resin, the other gold leaf – are by Pierre Giraudon. 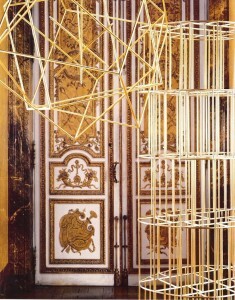 The light fixture on the left is by Hubert Le Gall, and the bookshelf on the right is by Vicenzo de Cotiis. 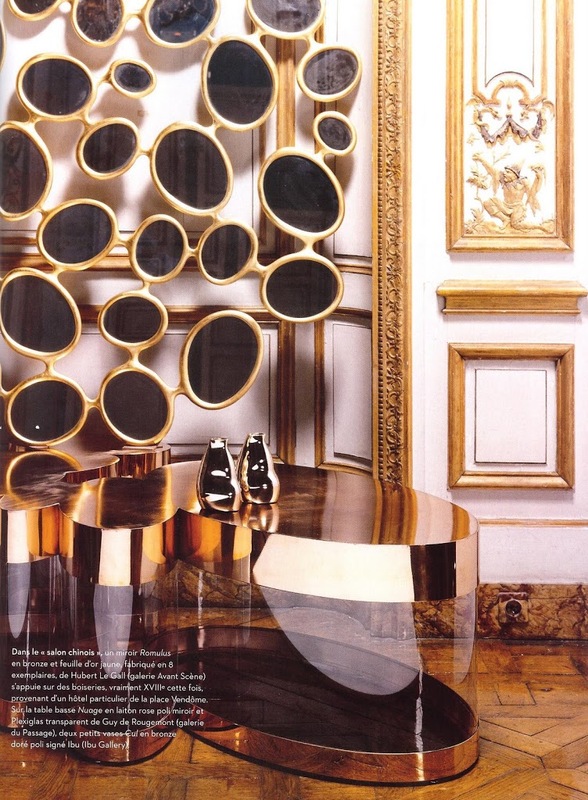 In front of a Herve van der Straeton mirror is a chair by Philippe Hiquilly, on top of which sits a rock table prototype by Arik Levy. Above a plexiglas and polished pink mirror table by Guy de Rougement is a mirror by Hubert Le Gall. 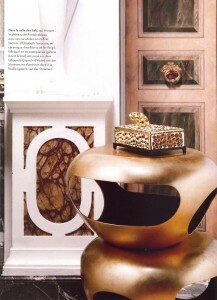 A small box by Elizabeth Garouste sits atop a piece by Herve van der Straeton. 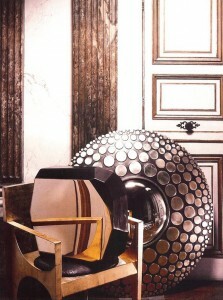 From Architectural Digest (France) No. 80, December 2008 – January 2009. All photos by Philippe Garcia.